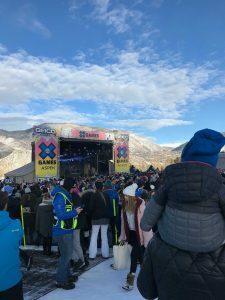 The Norwegian DJ Kygo traveled back to Buttermilk Mountain for a second time in his career to perform at the X Games Concerts. His return made him the second performer to have two shows at the X Games. Kyrre Gørvell-Dahll who goes under the stage name Kygo is originally from Beren, Norway and was the lone international musical performer this year. Not only is 27-year-old Dahll a world-class producer, but he has been taking piano lessons since he was 6-year-old. When he was a teenager he discovered Avicii and began remixing some of his songs before stumbling across his own unique sound, which has now been coined by many music journalists as “tropical house,” infuses with pan flutes, light beats and piano. When he travels back to his hometown, he still begins his songwriting process at the piano. Having performed at the Summer Olympics in 2016, Coachella in 2018 and the 2017 Electric Daisy Carnival, he’s no stranger to outside venues. Early in his set at the X Games, Dahll played a tribute song, Without You, for long-time friend and inspiration Avicii, who died in early 2018. The crowd’s response was tremendously humbling as everyone began singing along, aided by the similar fan base of both DJs. After that heartfelt moment, he moved onto Stargazing and Carry Me from his 2017 EP Stargazing. The energy of the crowd was drastically different than the first two shows of the weekend; There was no head-banging, not nearly as much jumping and more people just grooving in place. To be fair, this was the only show that happened while the sun was high in the sky, as his set kicked off at 3:30 p.m. It felt almost as if Dahll was trying to fight the elements while also emulating the production that the Chainsmokers brought to the table the night before with his own bright lights, smoke exploding from the stage and some pyrotechnics every now and then. Choosing to remix classic songs such as Good Vibrations by Marky Mark and the Funky Bunch, Boogie Wonderland by Earth, Wind and Fire and Freak Out! By The Mothers of Invention, Dahll showed his love for other genres of music and his creativity to turn it into his own sound. Ending his set with arguably his biggest hits, It Ain’t Me and a live vocal performance of Firestone, Dahll was able to defeat the elements once again and send his fans home smiling cheek to cheek.